A criticism often made of the ‘cozy’ in detective fiction is that it lacks the subtleties of more realistic types of crime fiction. Settings like rural villages form the backdrop and the detective is never a police officer; I’ve read cozies where the sleuth has been a florist or a maid or a stay-at-home mum pondering whether or not to return to work. Cozies are sometimes dismissed as providing comfort reading with a familiar protagonist and settings where there is murder but it’s seldom bloody or brutal. On the surface Colin Coterill’s THE CORONER'S LUNCH meets most of the above criteria. Dr. Siri Paiboun is a doctor (not a policeman) in 1970s Laos. While he does live in the capital Ventiane, not a lot happens. The revolution has ended, the new government is establishing itself and a lot of the population has crossed the Mekong River into Thailand to escape. This is where Dr. Siri comes in. After being sent to France as boy to study and qualifying as a doctor he meets his future wife and follows her into the communist party. Returning to Laos, he joins the revolution and tends the wounded. The story opens after the death of his wife and the overthrow of the government. Now aged 70, Siri is looking forward to a quiet retirement. Fate has other plans. Told that the former national coroner has crossed the river, Siri makes the reasonable objection that he has practiced medicine on the living, not the dead. However, he takes up his new post because it will give him ample opportunity for making fun of the new regime. A reluctant revolutionary, Siri suspects the new government will be as corrupt as the monarchy was. Part of the charm of this series is the relationships that Siri forms with other characters. In the morgue he comes to know Nurse Dtui and Mr Geung, his morgue assistant, and takes an interest in their lives, while never missing a chance to make trouble for his much younger superior. When the bodies of two Vietnamese pilots, shot down in the war pop up, Siri is called in to examine the bodies. He makes the acquaintance of Phosy, a police detective, and starts to investigate how the pilots really died. He is aided and abetted by his best friend Civilai, a minister in the new government, who has the same doubts about the new regime as Siri does. As Siri goes about his investigations, he hears an assassin has been hired to kill him. And on top of all this, Siri discovers he is the host for the shamanic spirit Yeh Ming…which explains why he can now see ghosts, but not talk to them. When this book was published it was compared to THE NUMBER 1 LADIES DETECTIVE AGENCY by Robert McCall Smith. The comparison isn’t apt, as I feel THE CORONER'S LUNCH is much more of a detective novel, with murder, rather than an examination of ‘philosophical’ crimes. The depiction of 1970s Laos was an eye opener for me, as I’ve never been there, though this series makes me want to visit. The image of Siri racing off on his trusty motorbike along a rice paddy to get to the local high school in order to convince the science teacher to examine some evidence because she’s the only one with chemicals, gives you some idea of the setting; the USSR is a new ally, and the Americans have left, taking a lot of the trappings of modern life with them. Siri’s hero is Maigret and he aims to find the truth wherever it lies. This series is into its 12th novel now (THE RAT CATCHER'S OLYMPICS is set in 1980 at the Moscow Olympic Games). I really enjoy reading this series because it does feel like seeing an old friend but also because it has a protagonist in his 70s who shows age is just a number and that life is to be lived. 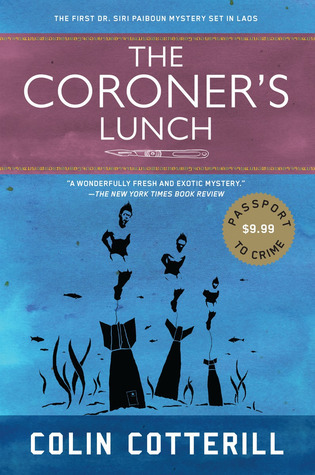 Yes, there are aspects of the cozy here, but THE CORONER'S LUNCH is a detective story that will show you a part of the world that might be new and a protagonist that is hard to forget.